This makes for a stunning centrepiece for any party, nibbles with drinks or general Christmas grazing. It’s a really quick and easy dish to pull together that will impress your guests and tempt them to tuck in. While the herbs are for garnish rather than eating, they need not be wasted and can be reused in a whole host of festive recipes (or throw some on the fire to infuse your home with fabulous Christmas scents!). 2. Cut the baguette into 12 slices on the diagonal. Arrange on a large baking tray and brush the oil over each side. Bake in the oven for 10 to 12 minutes, turning halfway through, until crisp and golden. Leave to cool. These can be made up to two days in advance and kept in an airtight container. 3. Meanwhile, place all of the ingredients for the dip in a mini blender and blitz until smooth. Season to taste and spoon into a serving bowl. Keep covered in the fridge until ready to serve. This can be made up to two days in advance. 4. To assemble, first arrange the rosemary and sage to form a circular wreath on a large round serving platter. 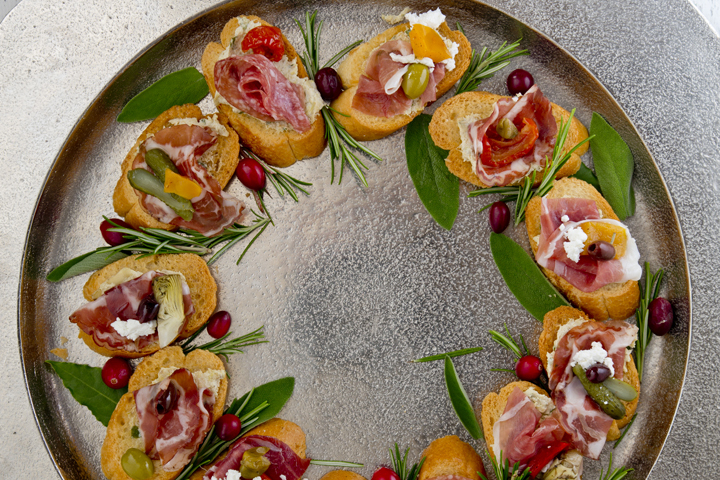 Now get creative and arrange the toasted bread, olives, cured meat (in ruffles), sun-dried tomatoes, peppers and figs, if using, in whatever fashion you fancy. The aim is that it resembles a Christmas wreath that looks stunning and is easy and fun for guests to share from. Sit the bowl of dip in the centre of the wreath and serve. For a speedier version, use crackers or crispbreads instead of the sliced baguette and use a shop-bought hummus or pesto instead of the dip. Create your own bespoke edible wreath by using other toppings, such as fresh cherry tomatoes, diced cooked beetroot, cubes of cheese, mini peppers or grapes.